The Road Ranger Blog: From Both Sides. Here's a couple of recent trucks I've snapped pictures and one from Paul on the other side of the Tasman. Akitio Trucking's Scania V8 loaded up and waiting for Monday morning at Matamau. A couple of shots of Opiki based Seymour's Transport's new Kenworth at Jackson Enterprises in Pahiatia. Paul has sent this great shot of a Ford LTL 9000 with sleeper box and pulling a set of B-doubles that he loaded with hay a few days ago. 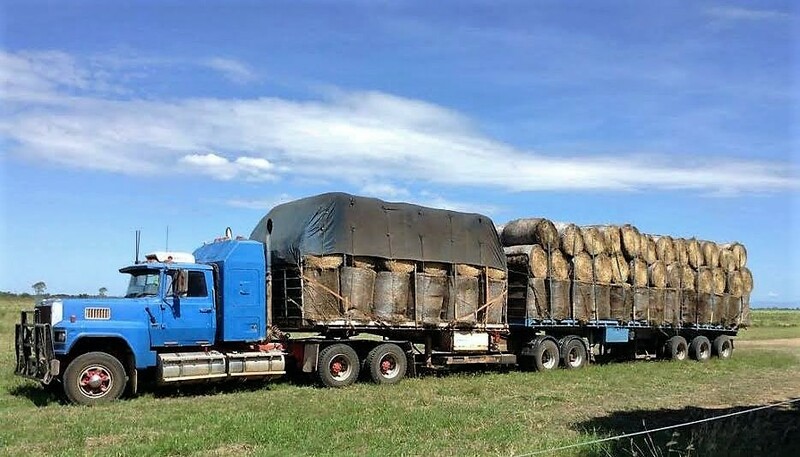 The Ford usually pulls a road-train in the Gulf of Carpentaria area, but due to the wet season's late arrival, has been running these loads to Winton, which is over 500 kms inland (as the crow flies) from the Queensland coast . I must say how I love the skies in all of Paul's recent photos. Blue skies are beautiful till live under, but photographically there's nothing better than blue skies, streaked with white clouds.